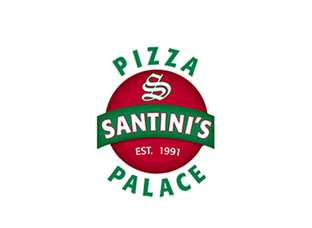 Online ordering menu for Santini's Pizza Palace. In addition to the tasty pizza we serve here at Santini's Pizza Palace, we also offer wings, calzones, pasta, and more! Try one of our sandwiches including the Turkey Club Sandwich or the Chicken Honey Mustard Sandwich. Don't forget to try our cheesesteaks and subs. We're located north of French Street at the corner of Hamilton Street and Franklin Blvd. We're by Naaman William Park and Walgreens. Order online for carryout or delivery!